Is JJ Abrams the new Steven Spielberg? Possibly. He is certainly an outstanding storyteller. He can come up with fantastic concepts (Lost, Alias). He can take us on heart-pounding adventures (Mission Impossible 3) that still resonate emotionally (Star Trek). And in the tradition of Spielberg, all his great characters have daddy issues. (He even used that as an episode title.) So Super 8 is poised to be this generations E.T. Did it succeed? The jury’s still out. I’ve occasionally stumbled across Ted Talks on MentalFloss.com but I’ve never really had the time to explore them. Yesterday I discovered this 20 minute manic and somewhat scattered speech by Lost & Alias creater, JJ Abrams. While I do wish he had gone a little deeper into the topics, I appreciate his perspective on mystery & what good “action” movies are really about. His thoughts reveal why he is such a successful writer and director. Enjoy. Randomness: So What Is Lens Flare? And Why Should I Care? Chick 2 can explain this better than I but for our loyal readers who are wondering, “What is lens flare and why should I care?” I will attempt to explain. Flare is what happens when light reflects within the lens. This happens when a light source (other than the light that is bouncing off your image) enters the camera and refracts off the glass. That’s one reason you don’t normally shoot directly toward a light. Notice something about these pictures. Yes, they are both from Star Trek. And they’re just the tip of the iceburg. In the last decade or so, it’s become more and more popular to use lens flare on purpose. It can be used for a variety of reasons; like making a film feel “real” or documentary-like or emphasizing how hot or bright a light source is in the story. (You often see this technique in a “lost in the desert” scene when someone looks up at the sun.) And when creating a fake environment (like a computer generated scene in space) details like flare can make that CG environment more believable. I get it. I get it. 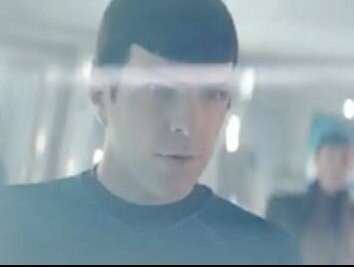 There are a lot of bright lights on the ship and a lot of shooting into suns & stars (yes, I realize they are the same things) so naturally there will be some flare but if I can’t actually see the film, there’s a problem. And why should I care? – Lens flare can be used purposefully to either enhance a story or obscure that story. PS. I still love you, JJ Abrams, and I would like to carry your briefcase and follow you around for a couple of years.